Rate includes: accomodation, all meals, activities (as per tentative programme), entrance fee and all the taxes. Chitwan needs no introduction. It is the home of 25% of the world's great one horned rhino and a substantial percent of the Royal Bengal tiger. It used to be, until as late as 1951, a hunting reserve where dignitaries were entertained. Up to 120 tigers were sometimes killed in a single hunting expedition. In 1970, Chitwan was declared a wildlife reserve and in 1973 it was designated The Chitwan National Park. Apart from the animals and forest, Chitwan is also famous for its annual pilgrimage to Dev Ghat at the confluence of Sri Krishna Gandaki and Trisuli. Here, since ancient times, hermits have been coming to meditate. Till today a hermitage exists. Chitwan is by far the biggest valley in Nepal and is the centre of the country. It is the most accessible part of Nepal. It is also anthropologist's delight. All major ethnic group are well represented in this valley and the people are well aware of the social and economic developments throughout the world. Hotel is located some 160 km from Kathmandu, 150 km from Pokhara, 180 km from Lumbini and 90 km from Hetauda. It is the exact centre of Nepal on the east west axis. Chitwan, an oriental almond eye shaped valley, is drained by two major rivers, Narayani and Rapti. These two rivers define the northern and western edges of the national park. The park itself is 932 square kilometres in area with altitudes varying from 200 meters to 700 meters above sea level. The national park is subtropical jungle of which 70% is Sal forest, Grassland cover 20% of the park . There are more than 50 different types of grasses, including the elephant grass (Saccharum spp. ), renowned for its immense height. It can grow up to 8m in height ! The shorter grasses (Imperate spp.) are used for roof thatching, and mats, rope and paper making. The remaining area are Riverine forest, water holes, sandy banks and flood plains. Rest of Chitwan valley is mainly agricultural area with patches of Sal forests. The Chitwan valley is bounded by Churia hills on the south and the Mahabharata range to the north. One horned rhinoceros, Gaur (bison), Deer (Sambar, spotted, Barking and Hog deer), Royal Bengal Tiger, Wild Elephant, Leopards, Jungle cats and civets, wild dogs and jackals, Langurs and rhesus monkeys, hornbills, folricans, storks and ducks, Snakes, Lizards, crocodiles and frogs are among few of the fauna that can be found in Chitwan. In all 50 species of mammals, 525 species of birds, 55 amphibians and reptiles, over 100 species of fish and 2 species of crocodiles can be found here. Many ethnic groups abound here from Chepangs to Tharus. Visits to ethnic villages are always a delight. Also there are a number of centres of religious importance where annual fair and pilgrimages are held. 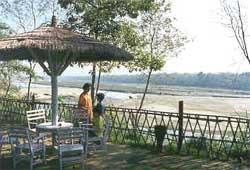 Chitwan is easily accessible by road, river and air. There are two highways each from Pokhara and Kathmandu and the east-west highways runs through the entire length of Chitwan. It is also served by several domestic airlines operating into Bharatpur airport. For the more adventurous, Chitwan can also be reached by one, two or three days rafting trips. In short, it is the most accessible part of Nepal. © Copyright 2010. 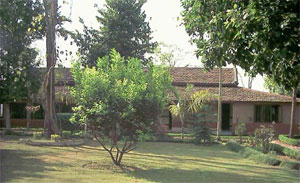 Safari Narayani Hotel Pvt. Ltd.